Many years ago , I wrote two particular pieces which have gained a good bit of attention. One was “What happens when The Church is not Free” and the other is ” The Black Regiment”. I have often been (with out knowing it or even trying to be) prophetic. It seems that many times I get these ideas and begin to speak on them, write them, record them etc. I am very excited to do it because I have believed I was being led by The Holy Spirit and want to be ever obedient and faithful to The Lord. I have been called from my childhood to be in ministry… come what may… and it has. I believe that The Lord has called me to be ” A watchman on the wall” (Ezekiel 3:17-27; other chapters). I know I am not the only one in this, only The Lord, Himself, knows how many He has called (only He knows how many have not answered His call). Ultimately, as the old hymn says, “though none go with me, I will follow!”… I must bear responsibility for being obedient (Acts 5:26-29 KJV)…. and accept the consequences. If you can not join me in some meaningful way (such as standing beside me and doing the same) please, at the very least, pray for me to be strong and of good courage (Joshua 1:7)… do what you can to provide support for this ministry… it does affect us all. There are those who might want to disagree with me but I have a similar anointing which one could expect to find in the early New Testament Church and during the foundational era of The American Constitutional Republic (oh, I suppose I am “first cousin” to reformers through out all history)… afterall, I am a reformed man myself by the grace of The Lord Jesus Christ! In every generation and in every country, The Lord has established those who would rather serve Him than anything else. Acts 1:8 tells us of Jesus’ command for us to be witnesses for Him everywhere beginning at home and then to the furthest extent of the world. Matthew 28:19 and Mark 16:15 (The Great Commission ) those verses say to teach the nations! I get accused of being political, well I will not take time in this writing to answer those claims except to say… “The Government is upon His shoulders” Isaiah 9:6… does Jesus Christ care what kind of government we have? Yes, Yes, Yes, He does! (Read Romans 13:1-3) and as a New Testament Christian, as an American and as a man, so do I! May I be so bold as to say you should care too… there are dire consequences for not being involved… to yourself and your posterity(an old fashioned word meaning your kin folk for generations). 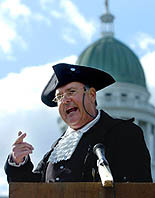 During the time period that I like to refer to as, “The Foundational Era of America” (from the landing of the Pilgrims/Puritans at Plymouth to the ratification of The Constitution of The United States and The Bill of Rights (First Ten Amendments 1620-1787-1791), there was some very strong Biblical preaching by various ministers of The Gospel. Much of that preaching was critical of The English government, both the king and parliament. It seemed that there was a “breed” of preachers who were not afraid to set a high standard for those in civil authority… a standard of Christian and Biblical proportions. This “breed” of preachers, coming from many different denominational backgrounds, thought it right and within their province to challenge civil authority. They occupied the moral high ground. We know this to be true because we have been blessed to read their sermons. These sermons were printed and duplicated in great numbers to be distributed among the colonies and to the colonists ( much as we have toady with various media types such as tapes, CDs, DVDs etc.). We have many such records in such volumes as Political Sermons of the Founding Era 1&2 1735-1805... reprinted by The Liberty Fund. Other such books, The Forgotten Heroes of Liberty written by Joel T. Headley give us a picture of a different type of “clergy” than we see today. These were the men of “The Black Regiment” ( The Patriot Pastors) who were so hated by King George III … he actually said he feared them more than any troops. Why were these preachers, pastors, clergymen called Heroes of Liberty? A clue is found in 2 Corinthians 3:16 …”Where The Spirit of The Lord is there is liberty”. These preachers proclaimed Biblical truth, The Sovereignty and The Lordship of King Jesus. It cost many of them their “lives, their fortunes and their sacred honor” ( as we read in The Declaration of Independence for example). After The War for American Independence was over, France was amazed at the success, growth and strength of America. The French had experienced a lengthy and bloody “Revolution” but their outcome was very different than that of America and they wanted to know why. The French government commissioned and dispatched Alexis DeToqueville to find the answer. After extensive travels throughout the new country of America, he reported this,”… I have traveled throughout their country and visited her churches and their pulpits are a blaze with righteousness… America is strong because America is good… if America ceases being good America will cease being strong”. His observations are accurate and prophetical. Where are we now United States of America? So I am blessed and glad to be called “The Patriot Pastor and a Heroe of Liberty” in this era of our manifest destiny. I am recruiting, discipling and training others in the cause of Christ and liberty. Yes, there is a cost and there are definite repercussions but I know it is not wrong to love and devotedly serve the true God, also love and serve my native land. It has not yet cost me what it cost the early New Testament Church or many of The Founders of America. I join others in praying… Oh, Lord, you who gave us life as a nation have blessed us… what have we done with our many blessings? My heart cries out for more “Patriot Pastors and Heroes of Liberty” who will stand up, speak out, declare, affirm and ratify The Father’s truth and The Founder’s Vision, who are not afraid to say GOD save America (Maranatha… save us and save us to the uttermost) … for I will have no other king but KING JESUS!